As you can see in <Figure 13-2>, the quantity of light reflected by the total mirror(high reflection mirror) changes abruptly by Q-switch. In this case, the number of excited-state atoms and amplifier gain during the optical amplification are comparable to those in the absence of a laser mirror but much greater than those with a laser mirror. This explains why a Q-switched laser has a very high peak power. As mentioned above, lasing starts when loop gain exceeds 1, with equal gain and loss. Pulsed laser is produced rapidly while the number of atoms in an excited-state and amplifier gain decrease. Laser output reaches the maximum value when the amplifier gain is reduced and loop gain drops to lower than 1. In a Q-switched laser, the loop gain starts to increase with activation of Q-switching, and lasing occurs when it passes the value of 1. When the loop gain drops to minimum, the Q-switch is turned off and lasing stops. <Figure 13-3> shows the gain and loss changes in a Q-switched laser through time. The energy output of a Q-switched laser is generally much lower than that of a free-running/long pulsed laser. One reason is that there residual energy always exists in the active medium(e.g., Nd:YAG rod) after Q-switching is over, and another reason is that spontaneous emission starts with optical amplification and a lot of energy is lost in the form of spontaneous emission before Q-switching is activated. One aspect to carefully consider before operating a Q-switched laser is the delay time between optical amplification and Q-switch activation. The delay time is determined by the upper level lifetime of the active medium; the energy stored in the active medium and amplifier gain start increase with the start of optical amplification and continues to rise until the delay time passes. Therefore, an active medium with a longer upper level lifetime can store much more energy. 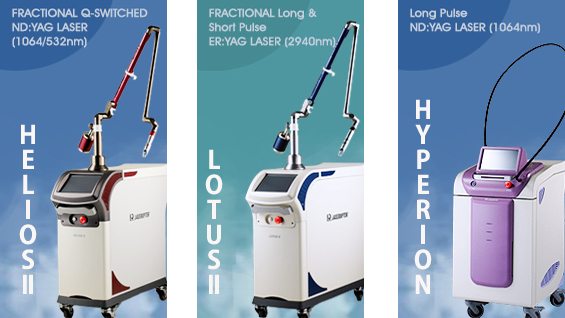 All solid state lasers, which have upper level lifetime ranging between 0.2 and 0.4ms, can use Q-switch effectively. Molecular gas lasers, including CO2 laser, also use Q-switch, however, argon/krypton ion lasers have very short upper level lifetimes, and cannot store a lot of energy in the active medium. Therefore they cannot carry out Q-switching as effectively. In the next article, we will take a look at nonlinear crystal and wave plate used in Q-switched lasers as well as long pulsed lasers and free running lasers.